There’s only one problem - one corner doesn’t stick down. This is the third one I’ve had, and all have been the same. Each was thoroughly cleaned and each time a different corner failed to stick down. Am I doing something wrong? I don’t know, because this isn’t mentioned in the inst! Great product and as described on site page. Very easy to fit, absolutely no bubbles or unsightly air marks but you must make sure screen is spotlessly clean. Great service as usual from mobile fun. This screen protector was very easy to apply and doesn’t impede any of the touch screen function, i have a few screen protecters and I would say this is the best. This is the first screen protector that fits perfectly on my iPhone. Great product easy to follow instructions and fitted within 5 mins. This was easier to place on the phone. This is my second tempered Glass Screen Protector for my iPhone 5S. I removed the first simply because a friend game me a phone flip case. I didn't like her case. I much prefer this. The edges and back of the phone are protected with another cover, and now the screen is protected too. Without any flaps, flips or interference, I can easily clean the glass, press the necessary buttons and push it into my handbag. Perfect. I found this placed easier on the phone screen using the little tags than the first one. Since my husband and I (no I'm not the queen) already have them, so when we got our grandson an iPhone it was an obvious choice really because of the quality and reliability of this product. The easiest screen protector to apply that I have ever bought. The screen protector was delivered promptly and looks good quality. I fitted it to a repaired, unused phone. The screen of the phone was therefore very clean. The screen protector was easy to fit and just sealed beautifully with no air bubbles at all. No more bubbles or dust flecks! Excellent product that is much easier to apply than film based protectors (e..g. Spigen Ultra Mix) which inherently flawed since they require removal from a backing sheet that charges them with static electricity that attracts dust particles no matter how scrupulous you are in preparation. The only problem that I experienced with the Olixar product was that the first item was delivered shattered. Mobile Fun sent a replacement without quibble. Once installed, the product is invisible and works particularly well with a slimline bumper case on an iPhone 5s. I do recommend this product to everyone, but I had a faulty with mine my glass broke after 2 days as I slightly dropped it on the pacement, but I was fine with it before even though I should have took extra care of my item. I didn't, I loves the screen protector it covera ever inch of the screen itself, it is very durable, strong, flexiable & elegant finish to it, I have been a fan for olixar for 4 years now & I have no doubt about there company alone as they are an good running business. I just didn't look after my item like other would, please don't let my review put you off buying as everyone should take care & give full attension to the things they buy over all mobile fun!! Have been fantastic & loyal to me with great support, customer service & responce.. Thank you! I am very happy with this screen protector. I recently bought a new iPhone 5s, so wanted something that was sturdy and looked nice. This was so easy to put on and any little bubbles could be pushed out easily. It fits very well and you would hardly know it was there. A great product at a good price! Well worth the money. Good quality. The screen cover was a perfect fit . Easy instructions for fitting . Good thick glass protector. Have tried various types on different devices and found this one to be one of the best. Great price. Great product. Everything you need to fit is in the pack. Alcohol wipe to remove grease and a cloth to make sure it's really clean. Then hold by edges pull the backing off using the tab and lightly put it in place on the phone. Then press in the middle and watch it "magically" seal itself onto the screen! It appears to be great so far!! My only warning is to make sure you are in a clean environment when you apply it to your phone. While I made sure the screen surface was clean, I should have blown on it to make sure all very fine strands were removed, as I soon discovered a very small grain and 2 small filaments trapped. I was able to remove the grain but still have the filaments trapped, but thankfully they are not to noticeable. Take good care attaching. But having said all that, it feels strong and fits well. Easy to fit, perfectly aligned, and no impact on operation. What more could you want? Best protector I have owned. A previous, different make, phone protector cracked when trying to fit. This protector is perfect, easy to fit and looks very smooth and classy. I received it today was supposed to yesterday but I forgot that it was next day and was sleeping when they came lol. So far I've been using it for a day and when I first applied it I have to say it was neat, very easy to apply and there's no air bubbles underneath. I normally buy expensive screen protectors but I bought this because it looked pretty good and I'm highly satisfied with it so far! Not too sure about how much stress the screen protector can take I might try it at some point and post another review. Received promptly and in excellent condition. A very good product and service. I will use again. Clear, essentially invisible. Whic h means it is easy to mis-place it. Perhaps some sort of frame could be good or warning to remove any cover/case. Also make sure screen is totally dust free..
Have bought three of these. The first ( on my iPhone 5c ) shattered when something sharp made contact this was good because that was why I purchased it. I instantly sent for a replacement - you shouldn't be without one of these! I've since obtained a 5s and have also bought another screen protector. They are so easy to fit. No bubbles. Excellent product which has certainly saved me the cost of a new screen. It was so irritating looking at a bubbled screen protector EVERY time I opened my iPhone 5 case that I had to do something about it. 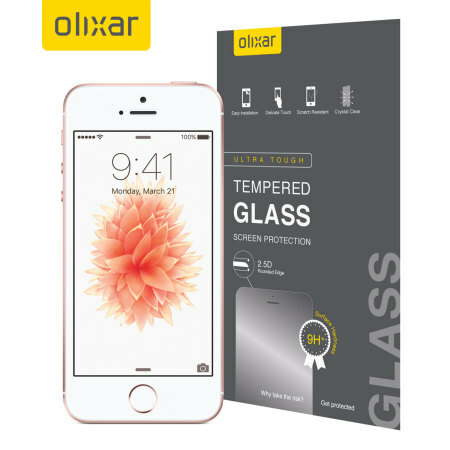 The Olixar Tempered Glass Screen Protector is in my view as good as the original glass it is protecting.Installing it is really easy, remove the bubbled protector, clean the phone glass, take the protective wrapping off the tempered glass, line it up and lay it on the phone glass. As if by magic the tempered glass settles on the phone expelling ALL bubbles. Magic! Top quality product that is very easy to fit and leaves no, yes no, bubbles. Would definitely recommend without hesitation. Having fitted many screen protectors over the years this one is the best looking, smoothest feel, superb reactive response and by far the easiest to fit. No bubbles, really slim, and easily installed / cleaned. Bought one for myself and my son, easy to apply with no air being trapped. Being tempered glass it provides good protection. It leaves a very small gap around the edge of the phone which is irrelevant. Excellent quality and very good value. I have paid more for similar product . Very good service . I have tried so many protectectors in the past and each time have ripped them off again because they spoil the look of the phone. This protectector went on without any bubbles and you could not even tell there is a protector on. I followed the instructions carefully and thoroughly cleaned the screen first with the moisture wipe, dried it off with the cloth and then used the sticky sheet (all provided) and there is not a mark to be seen. The only problem I have with this is the final instruction where it advises peel off the protector face when finished. I cannot seem to see this and because the screen looks perfect anyway have left it on. 1. No matter how meticulous your are at cleaning your screen there would always be the odd particulate that would spoil applying the screen protector. 2. There are several methods of ensuring that you remove all the air bubbles, in my experience none of are fool proof. 3. If you use a tight fitting protective case as well there is a chance that the case pushes against the edge of the screen protector which lifts it around the edges, allowing dust to get in behind. The Oxilar Tempered Glass Screen Protector has none of these issues. Provided you are meticulous in the cleaning of your phone's screen, just peel the protective backing on the screen protector, align and place down lightly. The special adhesive on the back of the glass protector does its work, no wrinkles bubbles or misfits due to stretching - simple, effective, Fantastic! What is more the screen protector is very well finished. The facing edges are rounded and polished so there are no sharp edges and no possible chances of edge chipping. Lastly its a tad smaller than the screen its self which is a useful feature, especially if you also use a tight fitting protective case. I use a Mophie case and it does not push on the edge of the screen protector which usually results in edge lifting. This screen protector there is no chance of that. All in all a very good investment. I have had screen protectors before, but they seem to end up scuffed and don't look good. This protector seem to be much stronger and will always clean up to a great shine. Do use the cleaning kit and the blue plastic sticky plastic. Whilst I cleaned the screen, I didn't read the instructions and didn't use the sticky plastic, so there was a tiny spec of dust on the screen which I didn't see until the screen protector was put on. Over recent weeks I have now bought 3 of these screen protectors for my family. Why? Because in my opinion its the best screen protector I have ever come across. Easy to fit; no trapped air bubbles. Touchscreen sensitivity maintained. Looks stunning. What more can you ask for in a screen protector! Screen Protector was a very good fit, not as easy to fit as advertised but went on ok after second attempt. I haven't had any accidents with my phone yet but it seems to be of very good quality. Bought this after receiving a promo email from MobileFun and looked good and a way to keep the screen from cracking in a fall. Really easy to apply, looks great and the screen is very clear when it's on the phone. The only downside is that with a case (I've got the INCASE one where the bottom detaches) the protector is that much thicker and is riding up at the edges due to this and causing bubbles. So not 100% (hence the 4/5) but if you don't use a case this is a great protector. Seems ok, fits reasonbly well and installs easily, however I spent 5 minutes trying to remove the "Protective layer off the outside of the cover as per the instructions then realised that there wasn't one, also if you have an iPhone 5s don't use the button covers that they send as they stop the fingerprint recognition on the phone from working. Best screen protector I've tried ! After trying several screen protectors and found them to be wanting, awkward to fit and all those bubbles ! I was pleasantly surprised by how easy this item was to fit and no bubbles, it's been on a week now and no scratches, I use phone for work, being in building trade it gets some rough treatment but seems fine so far. But pricey compared to some but it's true, sometimes you only get what you pay for. The glass screen protector is so much better than plastic one, it's much easier to fit with no bubbles and clearer and easier to clean. Brilliant. I bought this for my wife's 5c after I saw how well mine protected my 6+ after an impact with the kitchen floor (see review). Dead easy to fit with no air bubbles (watch out for dust - a steamy room is best e.g. kitchen near the kettle boiling!). The usual excellent service from Mobile Fun. With my new phone I thought I should invest in some real protection. I'd previously used thin plastic screen covers but wanted a bit more, so when I saw this I decided to try it. It was surprisingly easy to apply, unlike plastic protectors. Having lived with a couple of bubbles and bits of dust under my previous ones, I expected more of the same, but as soon as I put this on it seemed to have a life of its own, sticking to the underlying screen quickly and easily - you can see it happening before your eyes! Much easier than applying thinner products, and I'm sure it'll give better protection. I absolutely love the tempered glass screen saver. Makes my iphone look so much better than the plastic one. Looks very much like it doesn't have a screen saver on. Super easy to apply. No bubbles. Highly recommend this. Currently its doing it job. I have no touch sensitivity issues, seems very responsive. All I would say is take your time when applying it to make sure it lines up correctly as you only get one shot but once its on, its fine. The glass screen protector is so much better than my previous plastic one, it's much easier to fit with no bubbles and clearer and easier to clean. Brilliant. This is certainly the easiest screen protector to apply. It adheres to the display with no air bubbles whatsoever. However you do need to be careful to accurately align the glass particularly on iPhone models with Touch ID because, unlike conventional plastic film protectors it does add .25 mm of thickness so it is important not to obstruct the touch sensor. It does seem slightly perverse to use tempered glass to protect Gorilla Glass but once in place it simply disappears. Highly recommended. Blow bubbles a farewell kiss! This is a brilliant product, virtually fits itself and leaves your screen looking like the pristine original beneath. Not expensive. Does the job perfectly. Unless you are a West Ham fan (bubbles) (sorry) you should order one now. Quality Product the only Screen Protector worth buying. I purchased one of these recently for my iPhone 6 and was so happy I decided to purchase one for for my wife's iPhone 5c. Everything you need is within the packaging, installation is simple and the end result is faultless, there are no air pockets and you'd have to look hard to notice the screen protector. 5 stars without question would recommend highly. I'm very happy with this screen protector. The postage was very quick and it was professionally packaged. The screen protector came in a Perspex case with full instructions and cleaning materials. I have struggled in the past with normal screen protectors to get a decent finish with no bubbles but once this was lined up it literally sucked itself onto the screen with no bubbles or marks. The easiest screen protector I've ever used and judging by the stiffness of the glass the most protective as well. I have less fingerprints now, have still kept the screen sensitivity and it fits perfectly with my phone case (magpul). Couldn't ask for more! I have tried many touch screen protective membranes on the market for my iPhone 5S and they are all very fiddly to install and not 100% effective until I tried MFX Tempered Glass Screen Protector. No Air bubbles, very easy to install and exact fit to the screen. The glass screen is so thin and one cannot notice that my iPhone screen has a protective screen. Very good product. Screen protector was a good price and really easy to apply to the iphone. Zero air bubbles! At last, a screen protector that doesn't leave me frustrated. I usually end up feeling that it's not quite as perfect a job as it should be, but not this time. This one is so easy to fit and easy to get perfect first time. Seems to be robust and no problem with touch sensitivity. This is the ultimate smartphone screen protector. Yeeeeessss!!!!! At last a screen protector that doesn't bubble! The easiest one I've had to put on. Comes with a moisture screen wipe and drying cloth. Is honestly the easiest screen protector to fit. No temptation to peel it off which I'm usually always tempted to do! Fantastic screen cover. Really easy to apply although you only get one chance to get it right. Excellent delivery service as usual from mobile fun, with great communication. Having been an avid user of the power support crystal film sets on my previous iphone 4S I thought I would have a change on my new 5S. What can I say very easy to apply as it's rigid, looks and feels as if it isn't there at all! Very impressed so far after 2 weeks usage!